Chief Election Commissioner KM Nurul Huda has announced a plan to introduce electronic voting on a limited scale for the first time in parliamentary elections, discounting strong opposition from some political parties.In a televised speech on Thursday, Huda unveiled his plan for the use of electronic voting machines, or EVMs, in the 11th parliamentary election set for Dec 23. "We believe that if EVMs are used, it will improve the quality of the voting process and save time, money and labor," Huda said. 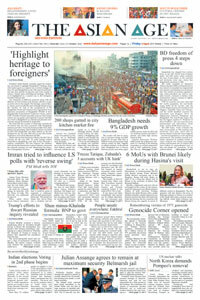 The Election Commission held exhibitions in districts and other areas to inform voters about the benefits of EVMs, reports bdnews24.com. Nearly 104.2 million people, including a little more than 51.6 million women, are registered as voters. They will elect their 300 representatives to parliament through the balloting in about 40,199 polling stations.In his speech, Huda said EVMs would be introduced to some urban areas but did not clarify how many polling stations would be marked for e-voting. Earlier, EVMs had partially been used in local government elections.Changes to the electoral laws had been necessary for the use of the machines in parliamentary polls.The EC recently took steps to change the laws to introduce e-voting in general elections, triggering a debate over "a hasty move ahead of the polls". The government finally approved the changes, but the current parliament's last sessions already ended by then. Later, President Md Abdul Hamid issued an ordinance, bringing changes to the Representation of the People Order or RPO for the use of the EVMs in general elections. The amended RPO has a minimum penalty of three years in prison and a maximum of seven years for the misuse of EVMs.This is also the first time an option has been kept for the candidates to submit nominations online. The Election Commission has completed the process of recruiting about 700,000 officials to conduct the polls.As many as 600,000 members of police, BGB, Bangladesh Coast Guard, Ansar and Village Defence Party will be deployed for law enforcement.In addition, the army will be deployed to aid the civil administration. The BNP and different other political groups have been opposing EVMs since the ATM Shamsul Huda-led EC introduced the machines in Bangladesh in the 2010 local government elections.The commission had said at the time that it would expand the use of EVMs as the machines would reduce cost and time of voting and counting. After the commissioners led by Nurul Huda took over, the EC resumed the use of EVMs and 'digitised EVMs' were made with the help of Bangladesh Machine Tools Factory or BMTF. When the EC had proposed a project for a large-scale use of EVMs weeks before officially launching preparations for the next elections, the BNP suspected foul play in the commission's move in the eleventh hour. The Awami League welcomed the EC's action and questioned the BNP's motive, claiming it reservations were bred by the fears of an electoral debacle.Prime Minister Sheikh Hasina, however, recently said she favoured a limited trial of the machines in the parliamentary elections. She suggested "a gradual rise in the use of EVMs to let the officials and the people learn and teach the new system first for getting used to", Planning Minister AHM Mustafa Kamal had said after the government cleared the EVM projectA total of 150,000 EVMs will be bought under the project to make the voting process transparent, reliable and free from errors, according to the minister. The estimated cost of the project is over Tk 38.25 billion and the time of completion is June, 2023, in three phases.The EVMs used by the current EC in recent polls are better than the ones used beforehand, according to Prof Md Haider Ali, a member of the commission's technical committee. "This machine leaves no room for rigging. 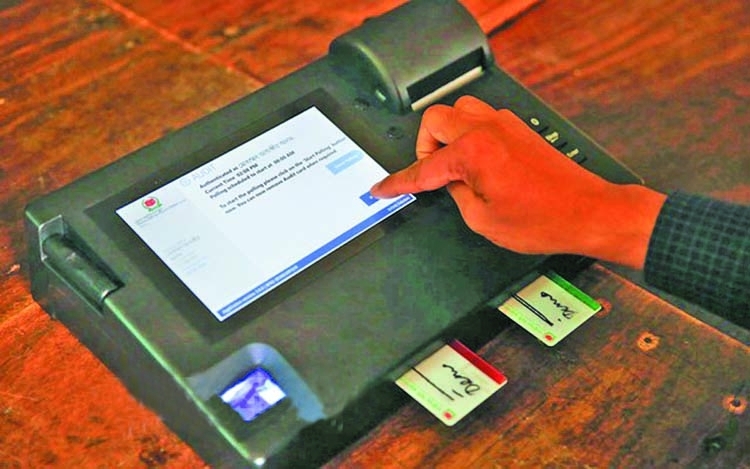 The ballot will be issued only after automatic verification is done to ensure the identity of the voter," Prof Ali, who teaches computer science and engineering at Dhaka University, had told bdnews24.com. "The voter can vote only after identification through fingerprints or NID," he had said.